The third version of Livescribe's voice-recording smartpen is taking your notes to the cloud. The Livescribe Sky comes with either 2GB, 4GB or 8GB of storage on board, and automatically syncs your notes wirelessly to cloud-based notes service Evernote. The move to the cloud is not without casualties, with Livescribe ditching its desktop software for the new pen, as well as shifting away from on-pen applications. Both will still be available for customers using the Livescribe Echo smartpen. To counter this, Livescribe has also introduced the ability for the Sky device to pair directly to tablets like the iPad using the pen's wireless functionality. At the Australian launch event, Livescribe's co founder Sasha Pesic explained that while doing research into what cloud based services its customers used, Evernote was by far the most popular, with almost 60 per cent using the service. "Evernote approached us and said 'is there something we can do together to provide added value to our respective customer bases'," Pesic explained. By partnering with Evernote, and launching the Sky Wi-Fi smartpen, Livescribe wants to create an ecosystem of having immediate access to notes wherever you are on any device. All Sky smartpen users automatically get a boost in Evernote storage to ensure they don't run out of free monthly space, while customers who purchase the 8GB pro pack get a free year-long subscription to Evernote Pro. 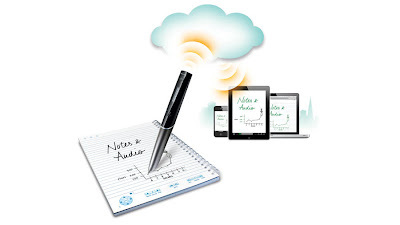 When the Sky pen is synced wirelessly using a Livescribe notebook, the pen first sends the notes to the Livescribe cloud before syncing with Evernote's servers. This allows Livescribe to offer services like handwriting recognition and print on demand functionality, according to Pesic. From there, a new HTML5 player offers playback of the digital notes on all browsers, as well as mobile devices. Livescribe has also launched an SDK, for mobile app developers to create Livescribe functionality within apps. Examples given were for apps that allow real-time annotation on documents stored in the tablet, as well as the ability to sign documents digitally.